Grey was found by members of the public on the 15th of November close to Pretoriuskop camp in the Kruger National Park. Kally Ubisi, section ranger, called in the help of Don English and Dr Louis van Schalkwyk to assist in the rescue of the rhino calf. It was too dangerous for the Park’s officials to fly him to Care for Wild Rhino Sanctuary due to bad weather, with heavy rain and thick fog making visibility very poor. They called in the CFW Rhino Sanctuary team to collect him at the Phabeni gate. The team had to cover the crate with canvas to protect and keep the little orphan warm when he arrived later that night. He was placed on drips and after 24hrs his condition picked up. He was then placed into a night-pen and monitored for another day before being introduced to Zac and Jemu. 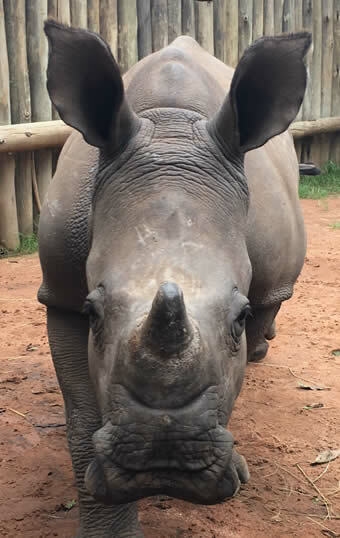 In mid-November, another orphan rhino, by the name of Spirit, was added to the group. The babies grew closer over the course of the week. On Thursday, the 24th November 2016, we moved the four baby orphans down to the big holding facility. Due to the severe drought, the condition of the babies was compromised even before their mothers’ death; they had no body reserves. At first, we were worried about one of the female orphans and we have since been monitoring them all, day and night. Together with this full-time monitoring, we are doing ground breaking research. We can happily report back that every day, all four orphaned baby rhinos are improving.